Gave as a gift. They loved the quality and style. Very warm and comfortable. Awesome, awesome hat. Excellent fit, quality. value and warmth. I ordered the cream/brown and it is gorgeous. I will be ordering the blue/grey next. Shipping was super fast to Canada. High quality material, excellent. Plenty of room. Love the hat! Very good quality and warm! This is exactly what I expected. I have purchased other hats from FHW and they have all been extraordinary! This one is no exception. The pompom is big and fluffy, it will attract a ton of praise when I wear it in winter, we are in the middle of summer right now. As well . . . the angora wool will keep my head nice and cozy and toasty! Thank you Fur Hat World. Ordered this a little unsure of the colour but it’s truly beautiful! Gorgeously made and so cute! A fabulous hat, very soft and comfortable and looks fantastic. Was surprised at the great quality and super fast delivery. So pleased - thank you so much. This hat was a gift for someone. I was very pleased with the quality of the product. It looks just like the picture. The price is reasonable, too. I loved this item ! Looks just like the picture, great quality. Really fast delivery, and was packaged really nicely too. Amazing product would really recommend it. 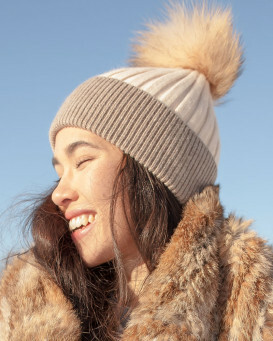 Beautiful warm hat, with an exquisite fur pom. Love the coloring of this hat. Classy. Great quality and fast shipping. I ordered for a gift.Arrived very fast.The hat and pom pom are as on the picture .Real luxury. Based on 14 customer reviews.